Even though he left office in December 2016 after serving on the Elk Grove City Council and Mayor for 10 years, Gary Davis has left his campaign fund intact. In financial disclosures filed with the Elk Grove City Clerk's office on January 31, 2017, the City's immediate past Mayor report his campaign fund has $42,666 for the period ending December 31, 2016. Davis started the six-month reporting period with $60,062 and spend $17,396. Davis, who was never known as generous to fellow Democratic candidates seeking office with cash donations, surprisingly gave $12,000 to the campaign of his mayoral successor and political protege Steve Ly. Once Davis announced his exit from elected office in July 2016, he no longer received donations. Interestingly, just before Davis announced he would not seek another term as Mayor, he became highly visible with the Wilton Rancheria just as they announced their intentions to build their $400 million casino resort on a portion of the unfinished Outlet Collection at Elk Grove. Davis co-hosted a public information session sponsored by the Wilton Rancheria just before he announced he would not seek another term. Although Davis would not commit to supporting the casino at that July 6 meeting, he stressed that he "supports the tribe." 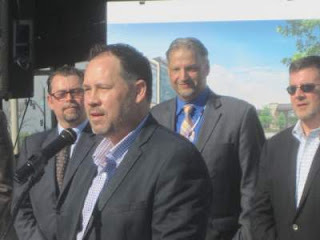 Despite public claims that he was neutral on the casino, emails uncovered from a public information request showed Davis, and Elk Grove Economic Development Director Darrell Doan had sought meetings with Las Vegas-based Boyd Gaming, who is the proposed financier of the casino. In his email seeking a meeting with Boyd Gaming, Doan asked Wilton Rancheria Chairman Raymond "Chuckie" Hitchcock to tell Boyd to "Make sure they know we [the City] are supportive." In November, along with City Council Member Steve Detrick, Davis voiced robo calls sponsored by the Wilton Rancheria urging Elk Grove voters to sign a petition in opposition to the casino that was circulation. Despite their efforts, that petition succeeded and was qualified for a referendum. Davis spoke glowingly of the proposed casino at last week's announcement by the Wilton Rancheria that their planned casino was proceeding after the parcel they purchased from the Howard Hughes Company was placed into trust. It is not known what relationship, financial or otherwise, Davis has with the tribe. No, no, no, you got it all wrong. He left office so he could spend more time with his kids. One thing's for sure though, his pocket is a little lighter because the FPPC fined him $400 last week for failure to pay required election committee fees twice.